In case you missed it back when it was announced, the Athlon 200GE - and the rest of the lineup coming later - is an entry-level APU which should fill in the gap below Raven Ridge APUs, the Ryzen 3 2200G and the 2400G. These Athlon SKUs are likely to put a lot of pressure on Intel's entry-level lineup. 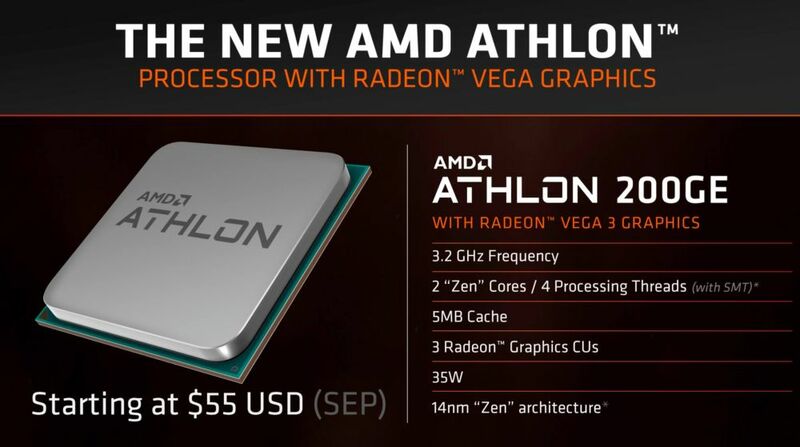 Specification-wise, the Athlon 200GE is a 35W TDP chip with two Zen CPU cores, four threads and Radeon Vega 3 graphics, which comes with three Compute units. The CPU part works at 3.2GHz, has 4MB of L3 cache and supports DDR4-2677 memory in dual-channel configuration. According to previous performance details provided by AMD, it will give the Pentium G4560 run for its money, and even should be enough for some casual 720p gaming. The AMD Athlon 200GE is now available from select retailers around the world, while the Athlon 220GE and the Athlon 240GE should be coming in Q4 2018. You can check out the full list of retailers/e-tailers over at AMD's website.